San Francisco-based artist Mitzi Pederson creates delicate, minimal sculptures out of accessible, everyday materials. Suspended plywood arcs cut through space, lines of thread fall gracefully from their edges, and translucent plastics create colorful reflections on surrounding walls. Deceptively simple, each element comes together in a carefully orchestrated balance to create objects that engage notions of perception, time, and memory. Mitzi Pederson was born in Stuart, Florida, in 1976 and lives in San Francisco. 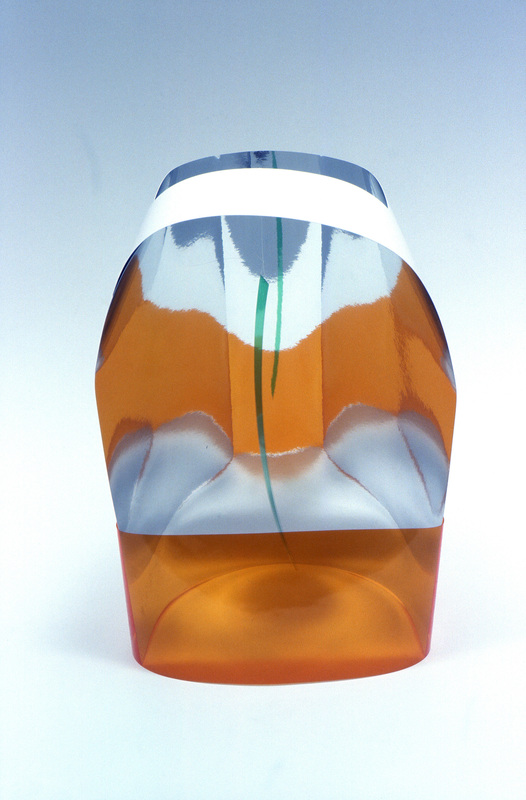 She received her BFA in 1999 from Carnegie Mellon University, Pittsburgh, and her MFA from the California College of the Arts, San Francisco. Pederson has had solo exhibitions at Ratio 3, San Francisco; Nicole Klagsbrun Gallery, New York; and White Columns, New York. Group exhibitions of her work include the 2008 Whitney Biennial at the Whitney Museum of American Art, New York; the 2006 SECA Art Award Exhibition at the San Francisco Museum of Modern Art; and those at New Langton Arts, San Francisco, and the Atlanta Contemporary Art Center. Writings on Pederson’s drawings and sculptures have appeared in Frieze, Flash Art, and artUS, as well as on Artforum.com. This is the artist’s first solo museum exhibition. An installation of Mitzi Pederson’s sculptures carries an aura of stillness and a subtle, humble energy. Building on the postminimalist practices of artists of the late 1960s and 1970s, such as Richard Tuttle and Eva Hesse, Pederson works with banal, everyday materials, often on a small and intimate scale. Thin sheets of wood wrap into cylindrical structures; mirror-lined papers bounce light back and forth; plastic rings dangle from strings; sand-encrusted wooden slats prop up one another, forming precariously balanced towers. Pederson uses these materials in part out of a desire to be simple and accessible. In an untitled work from 2006, a piece of plywood bends into an arc, held in place by a ribbon of blue cellophane. How the sculpture has been constructed is clear, yet one can see that it is more than the sum of its parts, that its materials have been carefully crafted into something new and unexpected. Pederson’s choice of materials also reflects the limitations of her studio space: relatively small in size, it does not accommodate constructions of great height or mass. Thus the artist resorts to what is lightweight and easily transportable, all held together with household items such as glue, string, or tape. In earlier works Pederson used found objects to construct her sculptures. More recently, however, she has sought out specific materials but limits her choices to those that are commercially produced. Each is widely available and carries with it particular properties and inconsistencies, and she plays within these constraints, pushing the material to its physical extremes by tugging, pulling, and placing it in unfamiliar positions. 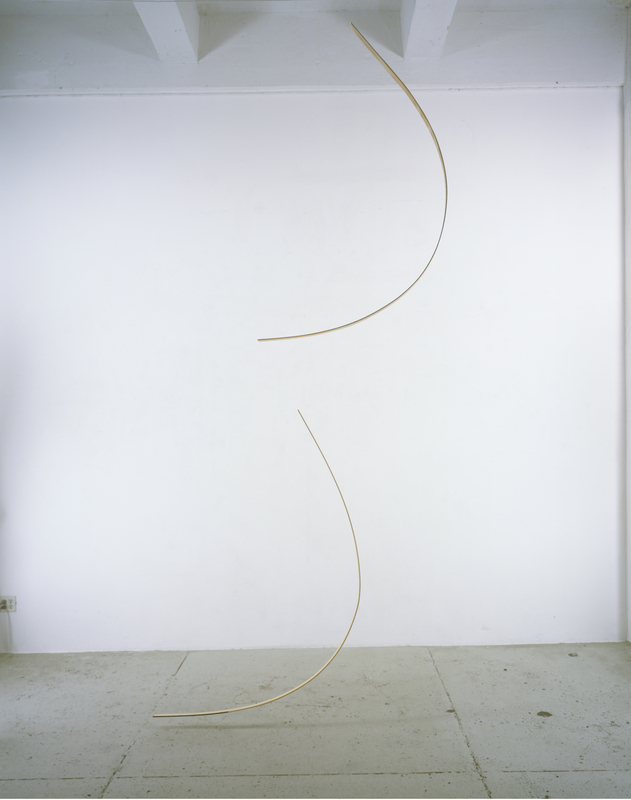 In the same untitled work from 2006, tightly stretched cellophane reaches from one corner of the plywood arc to the other, rippling under the strain. The cellophane’s tension causes the plywood to hover over the ground, barely touching the floor at two points, allowing air and light to travel beneath it. Decorative elements, like the tiny streak of glitter on the plywood’s top edge, add a touch of glamour to these simple materials, which the artist has transformed into alluring objects. In conceiving a sculpture, Pederson starts not from a particular idea about how the work will look once completed, but by bringing together elements in space and seeing how they work. She poses questions: How does sand change the solidity of flimsy plastic? How much tension can a piece of cellophane hold? What natural designs can be revealed by stripping down layers of plywood? The artist sketches out basic forms with pencil and paper, but it is on the wall of her studio, where dozens of miniature sculptures are casually pinned, that the physicality of these forms takes shape in what is essentially a three-dimensional sketchbook. Her process moves forward organically, piece by piece, and it inevitably continues during the work’s installation, when even more possibilities open up. The room’s light levels, the height of its ceiling, the color of its walls—all these factors influence her decisions in building the works into fully realized pieces, which she in turn adjusts to “fit” the space. Each is situated precariously but purposefully to catch the light and emphasize the fragility and temporality of the object. Indeed, like other postminimalist artists such as Robert Irwin and James Turrell, Pederson uses light and atmosphere as additional mediums. The spaces between the different elements of her sculptures are often just as important as the materials themselves. The artist constructed sometimes when (2007) from two wooden bows that seem to float in midair, suspended by filaments of fishing wire. The bows act as lines drawn through space, nearly touching both the ceiling and the ground as if they were measuring out the dimensions they occupy. Pederson makes one aware of the size of the space in which the work is installed as well as one’s physical relationship to both the object and the room. 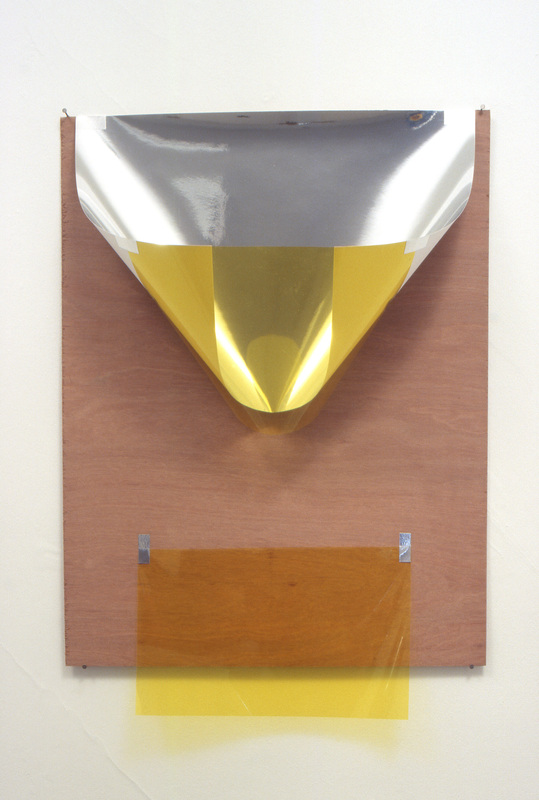 This sense of physicality is also present in inflexion (2007), in which a piece of reflective paper is taped to a wood panel with its upturned edges held in place by a yellow sheet of acrylic plastic. The folded corners form a funnel through which light pours down across the mirrored paper, its surface dissolving into streaks of angular reflection. Walking by, viewers find their distorted images incorporated into the sculpture; they become aware of themselves moving through the space, color and light bouncing off their skin as easily as they strike the wall. Each element, including the viewer, is bound into a whole, within which light, tension, and suspension lie in a cautious harmony. For certain, Pederson’s sculptures involve the viewer directly and invite sustained engagement. They encourage one to slow down for a moment in order to witness how the quality of light affects their varied surfaces; to discover how sections are constructed and interconnected; to walk around each object, noticing what different spatial perspectives can reveal. The sculptures themselves often move, changes in air pressure causing them to ripple gently or the laws of physics making them rock to and fro. Once the viewer’s movement enters the mix, a dynamic relationship unfolds in time, in which the perception of the objects changes gradually, adding depth of understanding through deliberate, studied looking. Mitzi Pederson builds upon the work of her forebears in that the basic quality of her materials and references grows and develops in time, in constant flux from their inception to their installation to their viewing. Her works engage us mentally and physically in a simple albeit carefully constructed dance. 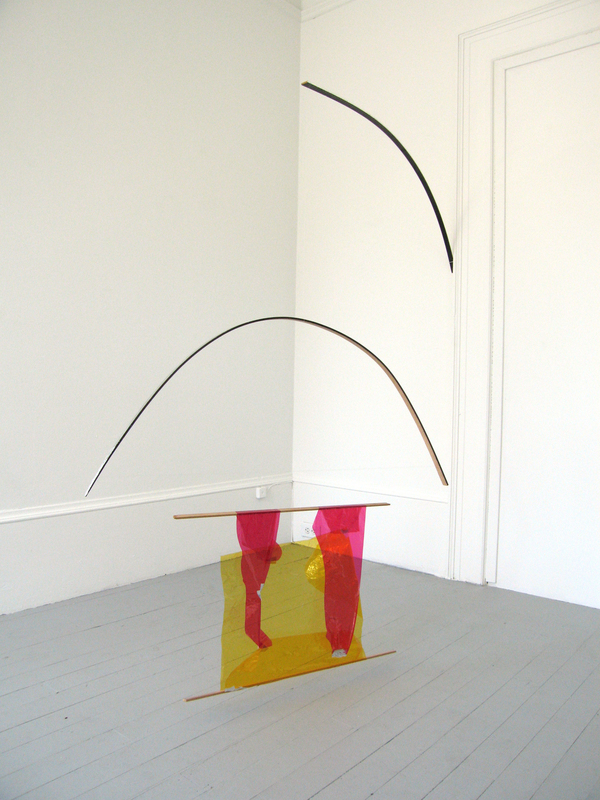 Her attention to the fragile balance among individual forms is essential to an installation wherein the thinnest of strings can hold wooden forms solidly in place, light and reflections become tools of expression, and viewers enter a space in which they become immersed in the artist’s process.